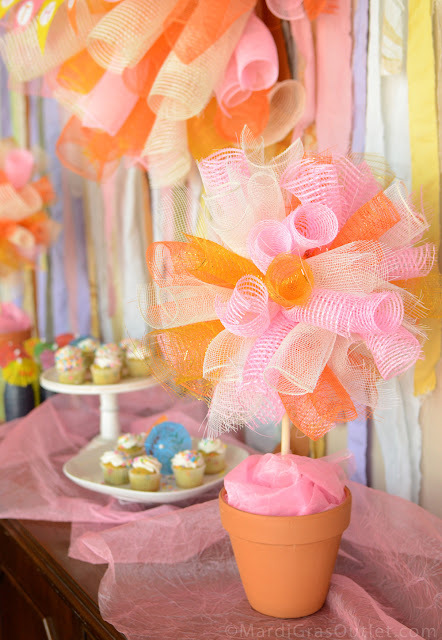 Summer treats from orange sherbet to pink cotton candy inspired the color theme for this summer sweets party! The popular trend of dessert buffets inspired us to create one of our own. We loved the idea of a pastel-toned party dessert table with snacks, sweet treats, drinks or a buffet of food. The decorations use our favorite design material- Deco Mesh- in unusual new ways. Tutorials for all these designs will be posted next. The pennant banner is a free printable graphic that you can download in this post. 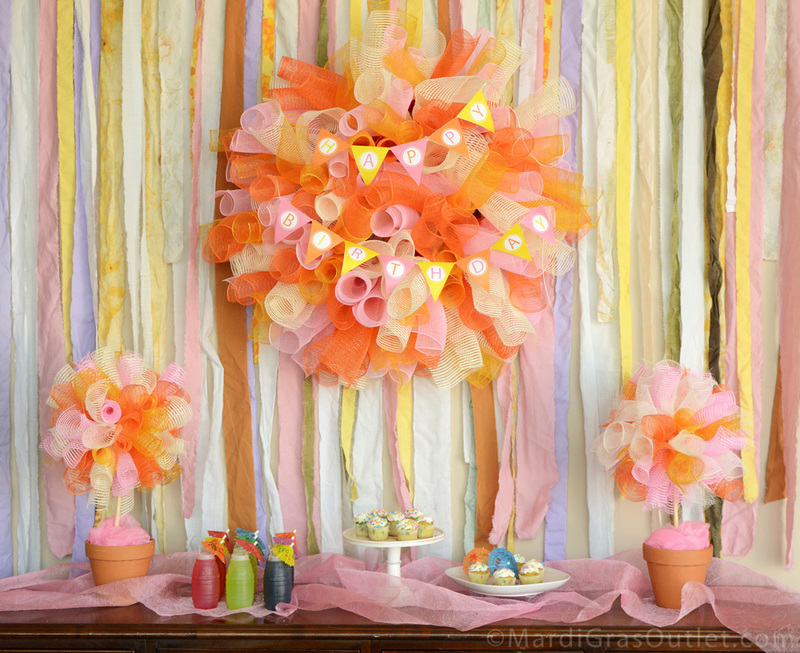 Till then, scroll down to enjoy all the photos of these yummy party decorations! We hope you find something that inspires you to celebrate a sweet summer! 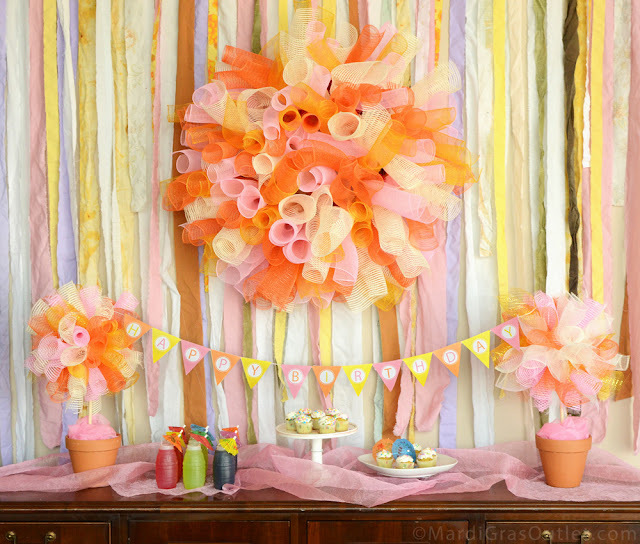 The main focal point for this dessert and treat table is a ginormous curls wreath, which is made from Deco Mesh. Click here for a photo tutorial on how to make this curly wreath! I know many of you have been clamoring for this tutorial. Deco Mesh curls naturally on its own, so it will be easier than you think to create on your own.The curl method is a great creative way to make a wreath. These deco mesh puffs are made in a similar way to the curly wreath, and a tutorial for these is posted here. The puffs can be hung from the ceiling or turned into a topiary with the help of a dowel, dry floral foam and a terracotta pot. 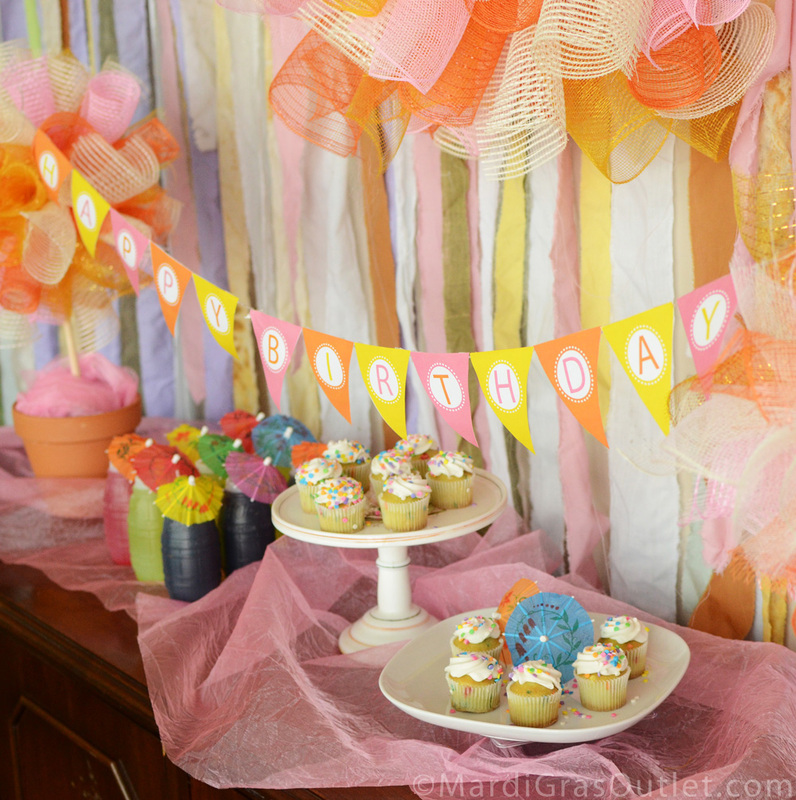 Top it all off with a precious birthday pennant banner. 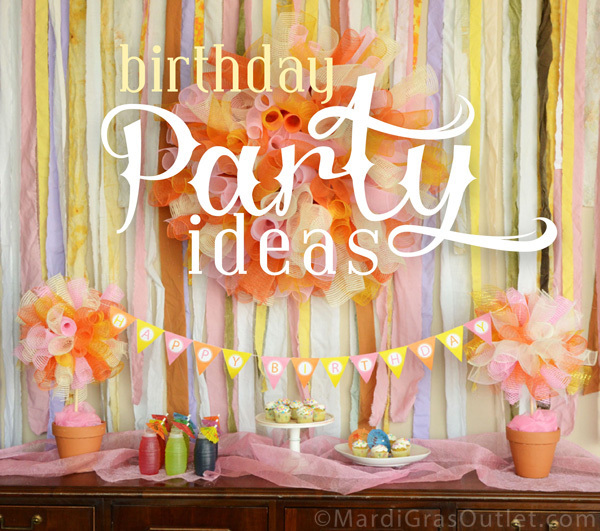 This Happy Birthday pennant is one of our free printable designs. You can hang the birthday garland between the two topiaries or use it to decorate the wreath. Click here for to the post with the free downloadable template! If you are looking for other free printable themes, click here. The gauzy fabric table runner added more pink to the table setting, and was used in the topiary bases. This material is called crinkle sheer, and is available HERE in this light pink color and many other colors as well. 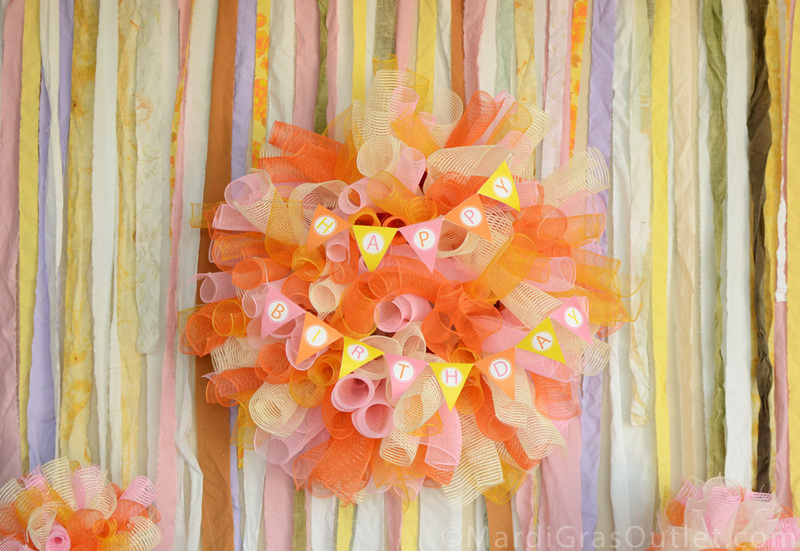 Crinkle sheer is also great for making bows and wreaths. A custom fabric strip backdrop pulls the whole pastel look together. 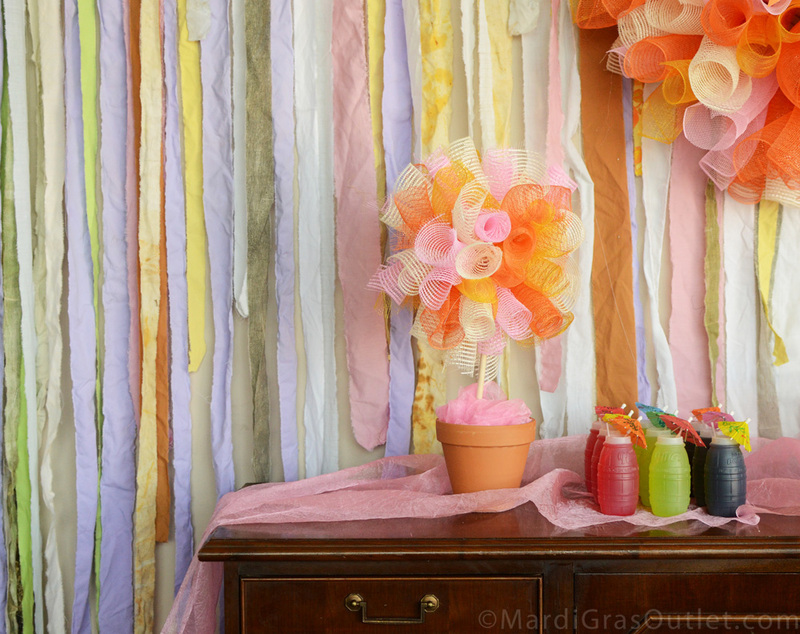 This fun party backdrop was handmade from strips of recycled cloth in pastel colors, by one of our favorite artists, Hannah at Orange Barrel Industries. Thin strips of up-cycled linens and sheets were individually cut and then sewn together at the top to create a wall of cascading fringe. Isn't it yummy! This backdrop would be precious for a wedding cake table or photo booth backdrop as well. Thanks Hannah for sharing it with us and our readers! Check out her tutorial for creating this pretty backdrop, here. In keeping with the multi-color palette, juice drinks were decorated with easy and inexpensive mini paper umbrellas, available here. 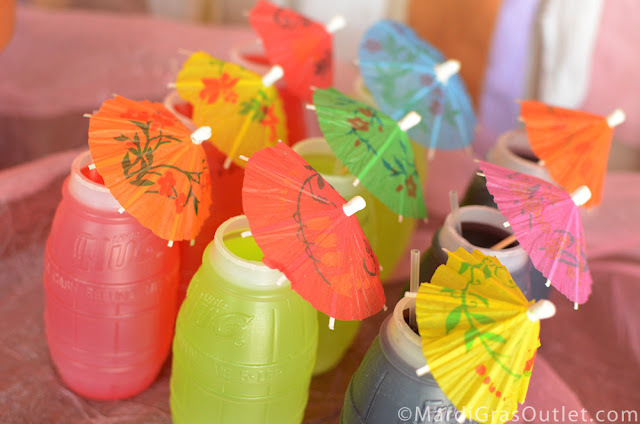 Just mix up the colors when setting these out for guests. 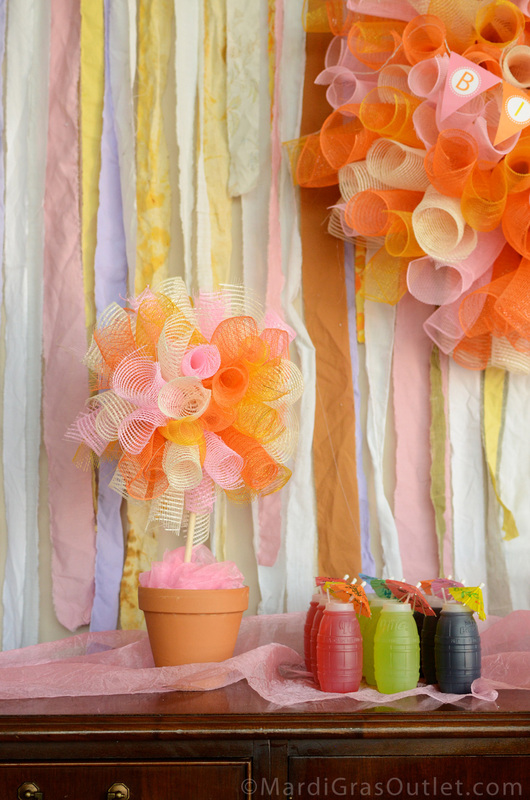 Mini Paper Umbrellas aren't just for drinks! 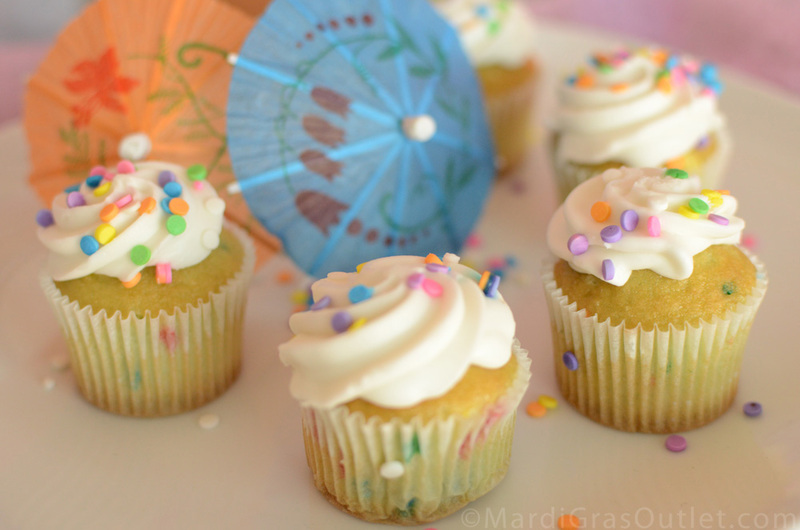 Use drink parasols to decorate cupcakes or food plates. Be sure to choose colorful snacks that coordinate with your color theme, like these pastel colored sprinkled cupcakes. As you can tell, we love working with Deco Mesh as a crafting product, and it comes in many different colors. Click here to see the range of summer and spring colors to create your decorations. Enjoy the slow pace of summer days by hosting a dessert buffet of your own. 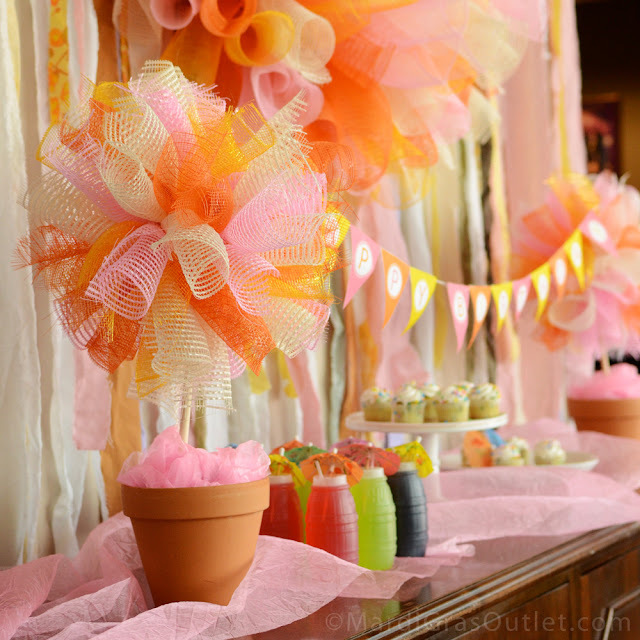 While you do not need an occasion to celebrate, these pastel decorations could work well for lots of other themed events like baby showers or birthday celebrations. The wreath and topiaries are PRECIOUS! Tessa- Glad you like them. We are posting tutorials for both this week and next! Stay tuned.